Former Thai PM Abhisit Vejjajiva has been charged with murder over the death of a taxi driver shot by soldiers during political violence. Mr Abhisit was prime minister when thousands of protesters took to the streets in 2010 demanding his government step down. He denies the charge, which supporters say is politically motivated. Mr Abhisit and his deputy at the time, Suthep Thaugsuban, are the first officials to face charges in connection with the deaths. Now the leader of the opposition, Mr Abhisit has defended his order for live ammunition to be used, saying government forces had "very little option" but to act when live fire was used against them. "We tried to negotiate with the protesters, and they wouldn't accept any of the deals that we offered them," he told the BBC. "It was our duty to restore order, and that's what we were trying to do." 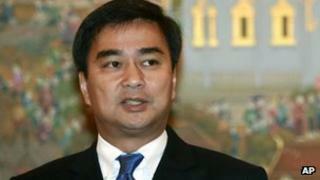 Mr Abhisit said he would fight to prove he was not guilty.